Larkspur (Consolida) flowers in that rare shade of blue and purple, that is so beloved of gardeners, are one of the joys of the self sown garden. 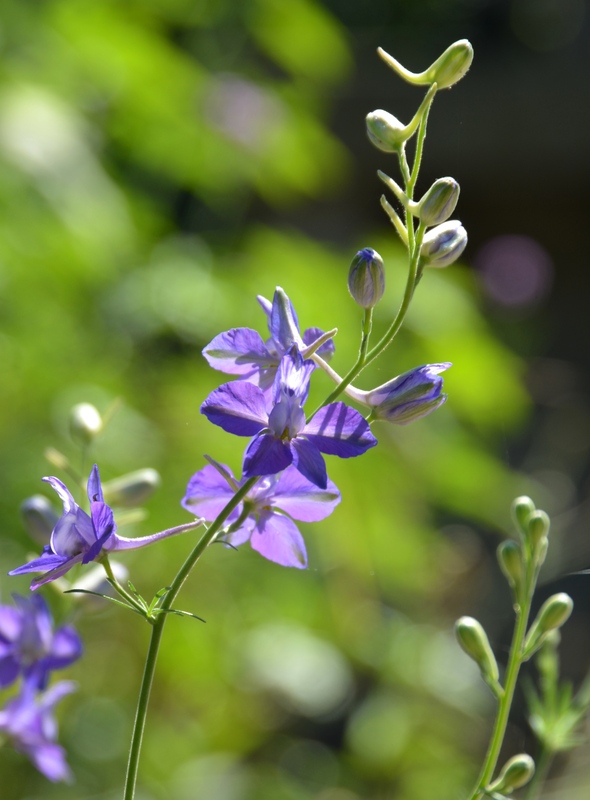 Rising gracefully to 2.5 – 3.5 feet, larkspur plants are perfect to mix and mingle in the flower bed, as they take up very little horizontal space. After the flower is pollinated and the seed heads develop, the little black seeds fall to the ground and lay dormant until cool weather and moisture cause germination. Somehow, seeds that fall in place always produce the best plants. The photograph above, taken in 2013, shows a lovely bank of larkspur flowers, mixed with Rose Campion and Poppies (of course) on Poppy Hill at Northview. Last winter was too cold for the larkspur seedlings to over-winter, which they often do here in Zone 6-7, so we have far fewer flowers this year. The few that we do have are even more precious. Note the spur on the back of the flower, (in the photo below) that gives this flower its name. If you want to add this flower to your garden, try to beg some seed from a gardening friend or a seed exchange. Direct sow where you would like them to flower. If you garden in a mild climate you may have larkspur in spring from fall grown plants. In colder climates the seeds germinate in spring and produce flowers from June to July. The flowers are great for cutting. Trimming spent flowers may encourage more branching and some more flowers, but remember to leave some seed heads on the plants to provide the seed to make next years flowers. Larkspur flowers (Consolida ) look like a smaller version of a Delphinium- to which they are closely related.